Discover how LeadMethod increases revenue by more than 20% through better distributor engagement. More than 31,000 manufacturers, reps, and distributors rely on LeadMethod. LeadMethod is the master at distributor engagement. With more than 31,000 active reps on the system, we know exactly how to get their attention early and often using email nurturing programs. We not only engage distributors, we help them sell more. The days of limited data on your distributors is done. With LeadMethod you will have feedback from distributors on every lead and opportunity. You’ll have a complete picture of your channel sales pipeline and the performance of all distributors. Integrate your distributor sales pipeline and performance data into your CRM to gain a complete picture of all sales operations. Real time 2-way integration with more than 65 systems including Salesforce, Microsoft Dynamics, SAP, Oracle, SugarCRM, HubSpot and more. Automate your lead capture and assignment, so your partners get leads fast, giving them the best chance of closing. 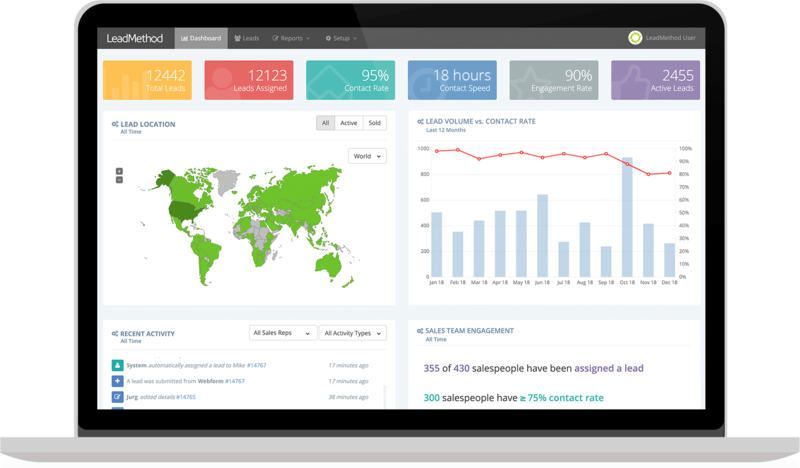 Auto append your leads in real time to give your partners better, more detailed information on every lead. We are masters at distributor engagement, so you know the status of your leads and opportunities. Help your distributors sell more by giving them the sales training and coaching they need, when following up on a lead. Full reporting on what happened with nearly every lead and opportunity, plus performance metrics on distributor sales reps.
Real time 2-way integration with your CRM so you have a clear picture on both your direct and channel sales pipeline and performance indicators.